enhance consciousness, and promote longevity. To contact us, for more information or to make an appointment, please click here. Many drugs only mask symptoms and do not correct the cause of the problem - and all drugs have side effects. Insurance companies are preventing you from getting well by denying alternative treatment programs. There are safe, effective alternatives to drugs, surgery and disease. With the world of HMO's growing rapidly, dissatisfaction with health care spreads like wildfire. 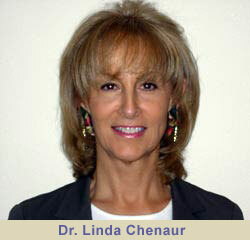 Dr Linda Chenaur received her Doctorate of Chiropractic degree from Los Angeles College of Chiropractic where she maintained Dean's List Status of Academics throughout her education. She has a Bachelor of Science Degree in Human Biology, and is skilled in the fields of Musculoskeletal diagnosis and treatment, Radiology, and Nutritional Counseling, as well as the alternative fields of Applied Kinesiology, Total Body Modification and Process Oriented Medicine. Our unique healthcare clinic offers personalized health care programs utilizing the integrated systems of synergistic natural healing and scientific western diagnosis, as well as advanced Eastern (Chinese), Western and European methods that may decrease or eliminate the need for medication or surgery. Holistic treatment is available to the entire family in a relaxed environment. Your treatment program will be designed specifically for your individual body (not a prescription formula based on a set of symptoms), seeking to eliminate the cause of your problem. After a complete orthopedic examination, treatment may include gentle adjustment of the spinal column and manipulation of extraspinal articulations, physical therapy, and nutritional or homeopathic supplementation. As a result of Dr Chenaur's diversified background, patients have also reported relief from such conditions as... Chronic Fatigue Syndrome, PMS, Fibromyalgia, stress and "burnout," sugar metabolism imbalances and weight problems. Her expertise could very well enhance and change your life. An evaluation including the nervous, vascular and lymphatic systems, nutrition, acupuncture points and cerebrospinal fluid. During this examination, the doctor may test a muscle and then, using your hand to stimulate nerve receptors or indicate change of energy patterns, derive additional information that might indicate abnormal function. These tests, along with other clinical findings, help indicate the most effective treatment. TBM is a simple, safe, natural method of analyzing the body's structural, physical and nutritional needs. TBM is not a method of diagnosis; it is a means by which a doctor uses the body's reflexes to accurately determine the root cause of a health problem. It is also a marvelous preventative technique that is used to find a problem before it becomes a full blown health issue. By utilizing this therapy we can correct existing health problems as well as prevent future illness. An integrated clinical approach to resolving the root causes of illness - causes which are frequently unresolved or misdiagnosed via standard western methodologies. Process Oriented Medicine utilizes recent technical advances and updated techniques in the field of laboratory medicine to enhance reliability and detect specific disease processes at a very early stage. Homeopathy is a healing process in which the medicines stimulate and encourage the body's natural healing forces of recovery. They are completely safe for babies, children and the elderly, with no unwanted side effects. Please contact us to make an appointment in our Santa Clarita office. We accept most insurance, Visa/Mastercard/Discover, and cash. ©2005 - 2011 Valencia Spine and Nerve Institute.